"If a husband is known to beat his wife, or allow himself to be “henpecked”, &c., the offender, if living in a village, will probably soon be serenaded with a rough concert of “music”. 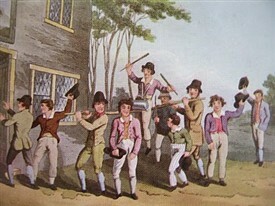 This is produced by men, women, and children of the village assembling, each provided with a frying pan, warming pan, and tea kettles, which are drummed with a key; iron pot lids serve as cymbals; fire shovels and tongs contribute to the noise; pokers or marrow bones; in fact, anything with which a loud, harsh, and discordant sound can be produced. Thus provided, the villagers proceed to the house of the culprit and salute him or her with an outburst of their music. This custom still lingers in most parts of the county. For what, and for why? And drinking so much when dry. With a ran, tan, tan. But he up wi’ his fisses, an’ he knocked her ower. With a ran, dan, dan. And you may depend upon’t I shall ride th’ stang. An’ he shall ride to hell. Other stang riding doggerels might be added, but we have given enough to give our readers a sufficient idea of their character". This page was added by Website Administrator on 20/12/2012.